It's Friday and that means I have a Design Team project up on the Just Imagine Crafts/Kreaxions Punches Blog. 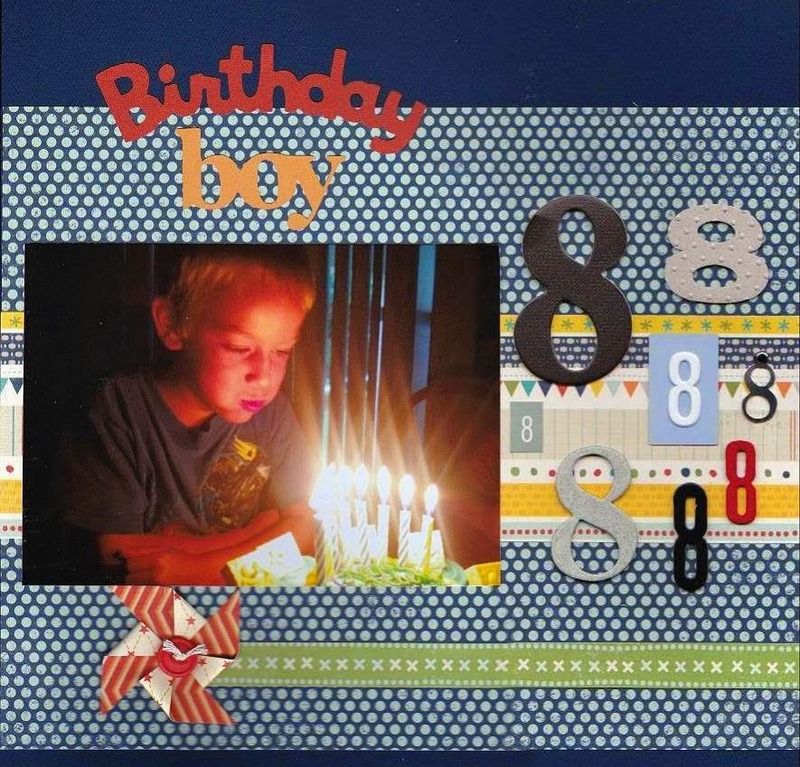 Isn’t it amazing how much a punched border strip can add to a layout?! I used the Kreaxions 4 in 1 punch #309. By punching both sides of the strip of paper I created an interesting border strip which became the focal point for this layout. After adding the cute photo of Vincent I raided my stash for a little of this and that to complete the page. My mother-in-law recently gave me some canning jars (mason jars). I have found so many uses for them in my crafting projects! One being this “Birthday In A Jar”. How fun would it be to receive this?!!! I just took a mason jar and decorated the outside with supplies I had from my scrapbooking stash. Every few months I make a trip to Hollo’s PaperCraft store. I love this place and can buy quality paper by the pound. When I went in June I purchased 17 pounds of paper. Besides paper they have a little bit of this and that. Every once in awhile I find that unexpected something. This last visit was no exception. I found these plastic checkbook covers that just had alter me written all over them … and so I did. and the negative punched pieces from the Kreaxions 4 in 1 punch #912. There is a Design Team Sketch Reveal up at Turtle Soup using one of Bev Code's awesome sketches. 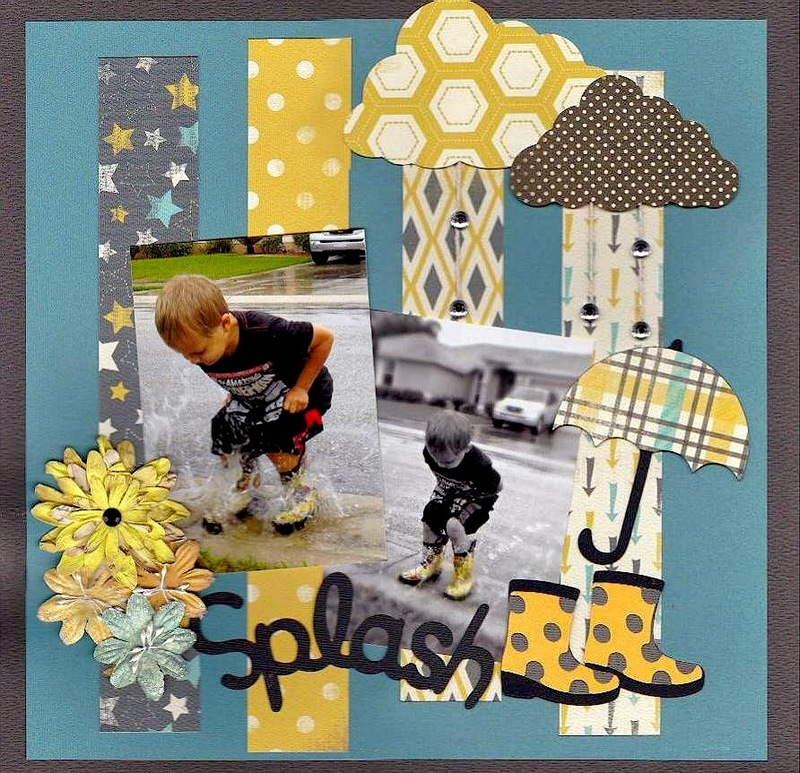 I created this page for my grandson’s Elisha’s album. Let me tell you it’s all about the rain boots lol! Be sure to stop by the Turtle Soup Forum and see what the rest of the Design Team did with Bev's sketch. The Design Team Reveal is up today on the Just Imagine Crafts/ Kreaxions Punches Blog. 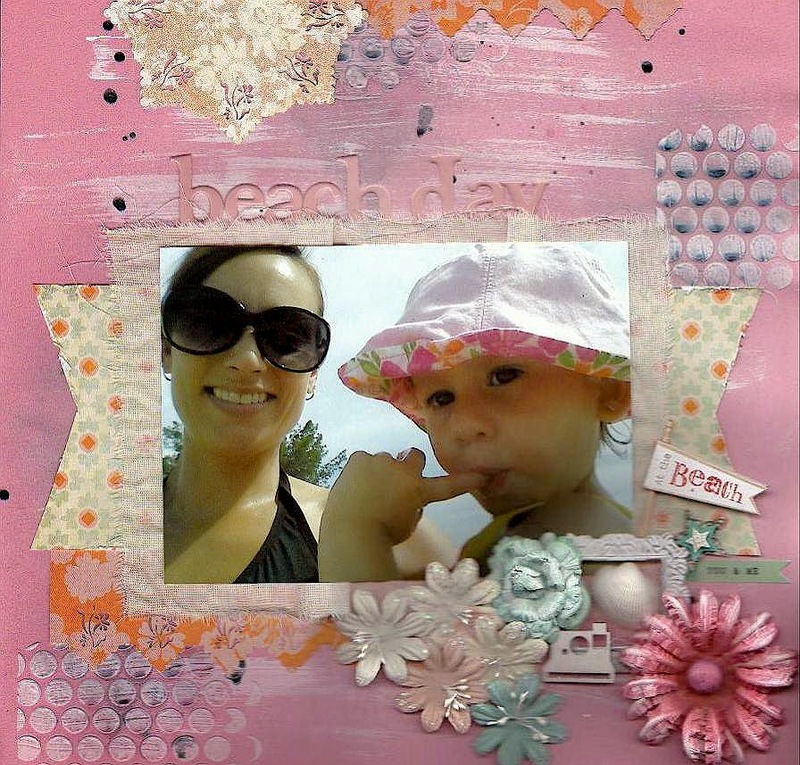 I completed a layout of Jessica and Gracelynn from one of their beach day trips. I made the doily at the top of the page using the star stencil and the Kreaxions Punch #303 with the “A” insert. I created the border strips using the Kreaxions Punch #303 with no insert. I utilized both the positive and negative pieces. Be sure to check out the Just Imagine Crafts/Kreaxions Punches Blog to see what the other design team members came up with. I had the opportunity to be a part of a traveling art journal group. How fun! I loved seeing all the other participants entries in the journal. My project for today is my entry in the art journal. I used the Kreaxions 4 in 1 punch #310 to create the border strips. I used both the positive and negative pieces. I find myself using my Kreaxions punches on all most all of my paper crafting projects. I love the detail this punch adds to the page. Today I have a challenge up at Turtle Soup for the month long Birthday Bash Crop. My challenge to you is to create a layout with numbers on it. The Design Team will be posting inspiring challenges every day this month. Be sure to stop by the pond and check them out. I thought I would celebrate the sprit of independence by making a patriotic wreath. I used the Kreaxions 4 in 1 punch #912 and the circle cutter. This punch added the perfect touch to the paper medallions and to me says fireworks. to see what the rest of the Design Team did this week.